Cookies are small bits of information which are downloaded to the device used to visit a website. Each time that the same website is visited again, this device will be recognised. By using cookies, information about visits and visitors will temporarily be saved by that website. Other websites may also recognise the device used through that same cookie. On each visit, various types of cookies may be used. The Little Bargain Hunter uses Google Analytics to analyse user activity. This data is gathered by google placing a cookie onto the device you have used to access this website. This allows The Little Bargain Hunter to calculate statistics about how this site is accessed, used by visitors and understand our audience break down by Age, Gender, and Interests. This data is held for 26 months before being automatically removed by Google. Every time you visit this website, the 26 month period is reset. You can ready more about how Google collects information here. 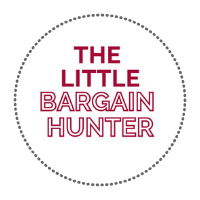 As The Little Bargain Hunter website is connected to it’s corresponding Facebook pages, Facebook may set a cookie on your device to determine if you have chosen to like it (or if any friends also like this page). We suggest consulting the Help section of your browser or taking a look at the About Cookies website which offers guidance for all modern browsers on how to block or remove cookies. _ga is a persistent cookie and is deleted 2 years after you leave the Site. This cookie is only valid for 1 minute.